Monday 11 February 1929. ‘A rainy day’, reported the diarist of the Venerable English College, ‘and a great one in Rome’s history’. While most of the seminarians had been enjoying the country air, the Lateran Treaty was signed between Italy and the Holy See, after many months of negotiation. This finally put an end to the heated ‘Roman Question’, concerning the temporal power and independence of the papacy in the context of Italy’s unification. The issue had been debated for much of the previous century and had generated an immense literature of argument and counter-argument, much of which is preserved in the College Archives. The debate had intensified after the pope lost control of the ‘States of the Church’, which covered much of central Italy, between 1861 and 1870. The capture of Rome by Italian troops on 20 September 1870 had led to a prolonged stalemate. 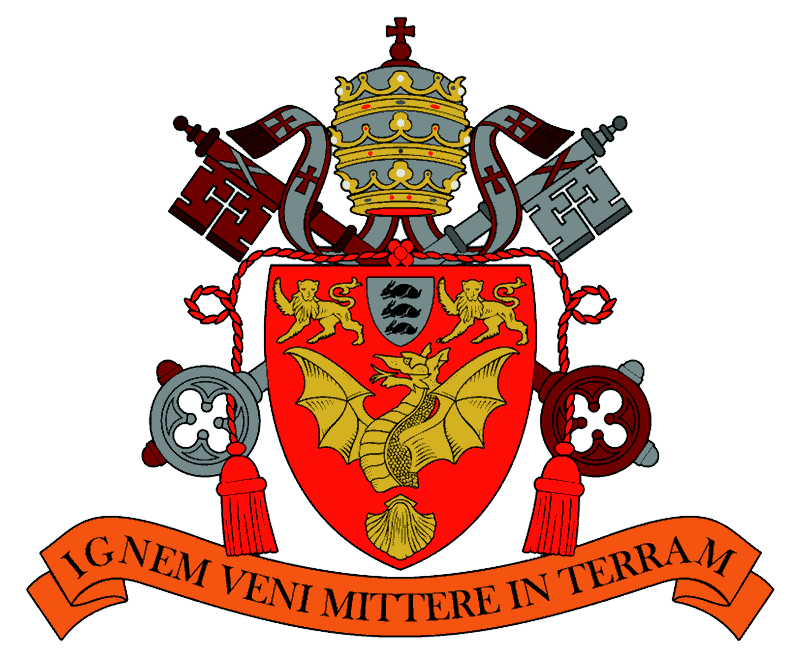 Successive popes, now bereft of temporal sovereignty, declared themselves to be ‘prisoners of the Vatican’ and refused to leave its venerable walls in case their actions were misconstrued as recognition of the Italian government. The King of Italy’s authority in the former papal territories was not officially recognised and Catholics were forbidden to participate in national politics. Popes refused to appear on the famous balcony of St Peter’s, which gave a fine view of the new capital of Italy, and were crowned in the safety of the Sistine Chapel. Many of the aristocratic families who owed their titles to the Holy See solemnly closed the doors of their palazzi and became known as the ‘black nobility’ since they were ‘in mourning’. the payment of compensation for lost papal possessions. The whole of Catholic Italy rose with one voice, forgetful for the moment of their political sentiments. The negotiations had been carried on with such secrecy and were shrouded in such mystery, that although the atmosphere was electric with rumour of every description, their publication could not but evoke a sudden outburst …All the streets and particularly the Corso were fired with colour; only the Cancelleria and the other ecclesiastical palaces preserved their sombre gravity… Even the old carrozza-drivers gave vent to their feelings in the form of little Papal ribbons in the lamps or twisted round the horses' ears. Even in the College common room, ‘a large old Papal flag was brought forth from some obscure corner and hung in the room’ and the strains of the piano were heard playing the ‘Pontifical Hymn’ and ‘O Roma Felix’ (The Venerabile, vol. 4, no. 3, pp. 221–222). 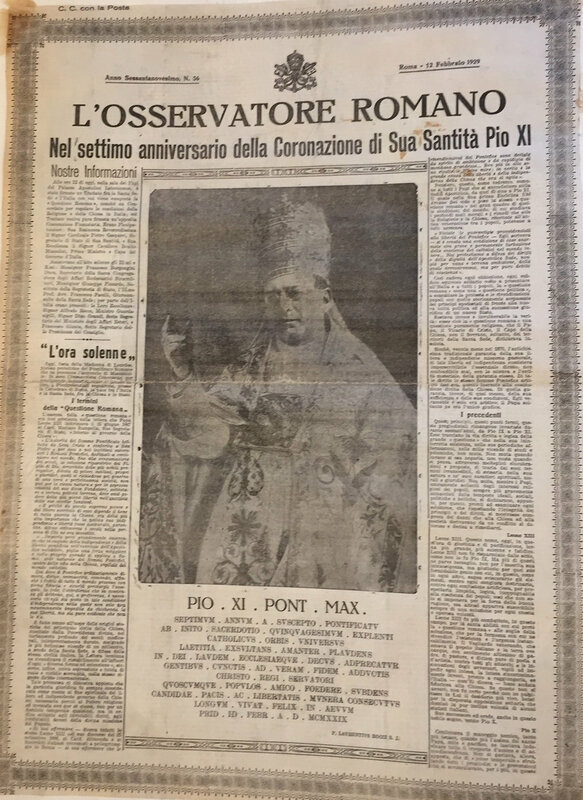 The following day, 12 February, was Shrove Tuesday and the seventh anniversary of Pius XI’s coronation. It was as if the whole of Rome hurried towards St Peter’s. Undaunted by the dense crowds, a number of College students ‘with their accustomed astuteness at baffling Papal soldiery’ were ‘able to slip into the Vatican at the foot of the Scala Regia and from windows near the Bronze Doors watch every moment in the loggia at a convenient distance. It had the additional advantage of being sheltered from the rain’ (The Venerabile, vol. 4, no. 3, pp. 222–223). ‘The cheering when the Holy Father appeared’, the diarist recorded, ‘was stupendous – the more remarkable as there seemed to be scarcely room to breathe’ (The Venerabile, vol. 4, no. 3, pp. 285–286). what we can rely on with certainty is that during our future summers at Palazzola we shall have the Holy Father not far from us on the other side of the lake. Perhaps we are not entirely unreasonable in hoping that we may be able to add to our tablets in the refectory yet another in commemoration of a pontiff’s visit. This site is Copyright © The Venerable English College Trust, on behalf of the Venerable English College, 2018. All rights reserved. Website by Riffly on Squarespace Developer Platform.